So.. “Windows 13” is out.. I mean… “Windows 10, Build 1607 Anniversary Edition” of course. And, it’s a pretty big update. To make your life easier I rounded up all the news about Group Policy and this build into one place. THIS PLACE. Item #3: Some Policy Setting items are ONLY in the Enterprise/Edu editions and NOT in Pro. Here’s that list so you don’t punch a wall, wondering why a setting isn’t working as expected on your Pro machines. Item #5: How do you find ONLY new policies for Win 10 Build 1607? Item #7: How to delay the Anniversary Update. Item #8: A bunch of stuff has changed around Windows Update. I’m working on chewing thru this; and promise to have it sorted out by the time the Chicago class happens. Soooooo… COME to the Chicago class, will ya!? Guarantee: 100% guaranteed to be awesome or your money back. Really and truely. Got 4 or more people? Gotta call us for mega discount: 215-391-0096. Thousands of admins have taken (and RE-TAKEN) my killer Group Policy Class. Get up to speed (or get up to speed AGAIN if you need to). So on Patch Tuesday, Microsoft released a patch to prevent a theoretical “man in the middle attack” when GPOs are downloaded from your servers to your endpoints. But when that patch is applied, there is a “double increase” in security, one with an unintended consequence. That consequence is that SOME GPOs will no longer apply when you expected them to. You could call this a “breaking change”, but.. stick with me, I think Microsoft wanted this behavior updated. And it’s not TERRIBLE; it’s simply somewhat inconvenient to fix and make right again. 1. The patch MS16-072 is applied to your endpoint computers (the ones which PROCESSS GPOs). 2. Admin has REMOVED Authenticated Users in Security Filter. 3. Admin has specified specific USERS (directly or via Group membership) in Security filter. ALL user-side GPOs should be processed when a USER has READ/AGP rights, even if the computer itself has no read / AGP rights access to a particular GPO. So the big change is that in order to process USER side GPOs, the COMPUTER needs READ access. And when you remove AUTHENTICATED USERS from the GPO, the COMPUTER cannot perform the READ it needs.. and hence, user-side GPOs are not processed as expected. TIP: READ THIS BLOG ENTRY ALL THE WAY THRU TO DECIDE WHICH IS BEST FOR YOU. You might be asking WHY Microsoft made the change. Short story: It’s a prevent of a theoretical attack, and ensures that the computer does all the work with Kerberos. Jeremy, should I add DOMAIN COMPUTERS to the SECURITY FILTERING section? Or should I just add DOMAIN COMPUTERS to the DELEGATION TAB? So there are advantages and disadvantages to each approach. In a PERFECT world, if you followed best practices by NOT mixing USER and COMPUTER side stuff, there would be no particular consequence for adding DOMAIN COMPUTERS to the Security Filtering tab. Said another way, if NO GPOs had COMPUTER side stuff, then the computer would have nothing in particular to apply when you made this change. When you do this, you don’t get CLARITY that the rights are correct. You have no idea that the Group Policy will actually process.. unless you peek (again) at the Delegation tab. But the upside here is that if you have “mixed GPOs” with COMPUTER side stuff into the same GPO, you won’t start to process “dormant items” that didn’t apply yesterday and will (uh-oh) magically apply today. Update 6-22-16 to the question: “Should I add Authenticated Users or Domain Computers” when I choose a method? So I got this question a lot, and here’s my vote: Use Domain Computers and not Authenticated Users. Yes, either will work, but I think Domain Computers is slightly better to add. Domain Computers are.. well, domain computers. And Authenticated Users are… well, Authenticated Users *AND* Domain Computers. (As I like to say… “Computers are People Too”). So, it’s the minimum rights required are Domain Computers.. because THEY (the computers) are now in charge of the whole “Lookup and download” operation, Where before.. it was a two-part affair. TIP: The “DC” in the string is “Domain Computers” not the “Domain Controllers”. In case you care, Domain Controllers “short name” is “ED” which means “Enterprise Domain Controllers”. 5. Close ADSI edit. Then also close the GPMC (if opened.) And re-open the GPMC. Again: when this is over, all new GPOs you create will have the following stamp on them: http://screencast.com/t/YUJ0k9Fw4q . Do all the steps to the LIVE GPOs like we already talked about. Mass Import from Production AFTER that.. or else AGPM doesn’t know you did anything in the real world. Set AGPM’s permissions such that when a GPO is DEPLOYED it has the right stamp. Again, the blog entry does a reasonable job of explaining that, so I’m not going to re-do the step-by-steps here. Hope this information helps you out, and you’ll consider getting serious GP training from me at www.GPanswers.com/training … Live and Online training ! And consider PolicyPak to manage the heck out of all browsers and apps: IE, Firefox, Chrome.. plus Java, Flash, and hundreds more. Thru Group Policy, SCCM or thru the cloud. Your pal, Jeremy Moskowitz, Group Policy MVP. Thanks to my Fellow Group Policy MVPs for technical review of this article. AMA replay now live, and Group Policy Not Dead Manifesto .. Updated ! 2. Group Policy not in Nano Server (Not News to me), but I updated the Why GP is Not Dead Manifesto. Also, I already knew this, but apparently it was NOT known by some that Windows’ new Nano server has no Group Policy support. You’d think I’d be upset about this, but I’m not. Not even a little bit. As such, I’ve updated my “Why GP Is not Dead” manifesto. It’s another GPanswers.com Blog entry, and that link is here. You can find that important reading here. 3. Microsoft also figured out that it’s too insane to bring up a new Windows 7 machine nowadays with 897 patches. So they they have a “rollup” of all the important fixes since Windows 7 SP1. Excellent. This is awesome. Download it here to add to your (new) Windows 7 + SP1 build images. Be sure to check out the associated KB article, https://support.microsoft.com/en-us/kb/3125574. You might have read the news that it’s no longer possible to use the built-in Group Policy SETTING to prevent access to the Windows Store starting in Windows 10 / 1511 with some updates. I don’t make the news, I just report it. The official article at Microsoft is “Can’t disable Windows Store in Windows 10 Pro through Group Policy: https://support.microsoft.com/en-us/kb/3135657“. Except, good news.. turns out there IS a way to prevent Windows Store from running with Windows 10 Pro Video. For more killer tips, be sure to sign up at https://www.gpanswers.com/register/ for the newsletter list to stay informed. For Group Policy training, (live and online) sign up at https://www.gpanswers.com/training. And to extend Group Policy to manage applications and browsers, check out www.PolicyPak.com. UPDATE: Found another technique which works with “Software Restriction Policies”, which is a little less intense than using, say, AppLocker to do it. Personally, I prefer the method in MY video, but this alternate method using SRP should work a-ok for most people as well. Link to another blog / video. A student in a recent class showed me this article, which demonstrates how to make Scheduled Tasks (correctly) run as SYSTEM. I didn’t know this was a bug, but I’m glad I know there’s a fix ! Good job, MadDog 2050.. whomever you are ! If you thought only crazy people wrote Manifestos, then call me crazy. Yes, I’m crazy for Group Policy, and I also get a little crazy about Group Policy’s misunderstandings and misunderstood place in the modern “mobile first, cloud first” world Microsoft has in mind and where might all go someday. Group Policy is NOT dead. And, more importantly, it’s MORE IMPORTANT than ever when it comes to Windows 10. 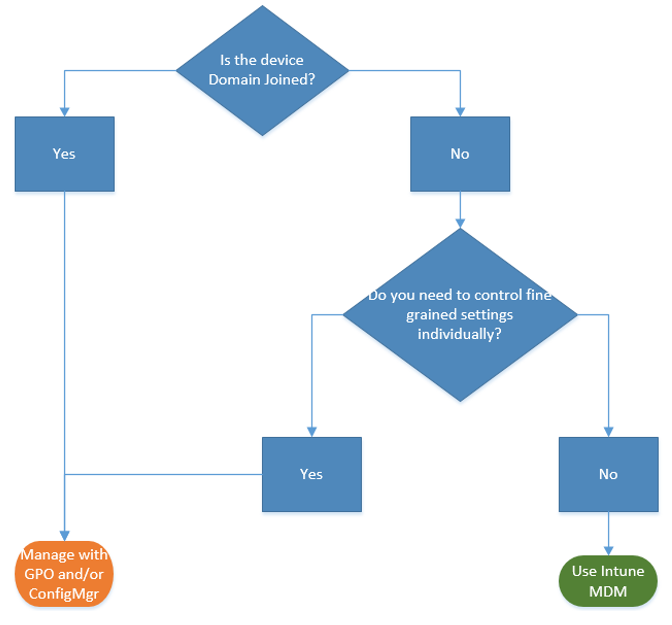 Group Policy is the best way to granularly configure domain joined Windows PCs and tablets connected to the corporate network using Windows-based tools. Microsoft continues to add Group Policy settings with each new version of Windows. And, if we look at the flowchart Microsoft provides, it’s clear as day. This becomes a very, very simple “If domain joined, then use Group Policy” decision tree. And that represents about 98% of the Windows PC systems in the world today. Maybe 99%. Do you have domain joined Windows PCs and tablets? You do? Then you should use Group Policy, which is the best way to manage them. Do you need to granularly configure settings? You do? Then Group Policy is the best way to do that. Are you considering (or already moving to Windows 10?) You are? Then Group Policy is there to help you manage these new settings which are only available in Windows 10. Look, I get it. It’s a confusing “landscape” of tools out there from Microsoft now to manage Windows machines. Group Policy has the most settings, the most ability, most flexibility and granularity, comes in the box, works when you log on and/or reboot, has reporting, tooling, guidance, third-party extensibility and it usually JUST WORKS as expected – across millions of PCs, millions of times and countless changes and updates a day. This is why Group Policy is the BEST WAY for domain joined Windows PCs. Okay then: So what are the other management tools that Microsoft has, and what are they “best at”? Microsoft has a huge variety of ways to manage Windows devices. In fact, so many, that I must deliberately omit some in this analysis for fear you will fall asleep and not make it to the end. So, here is a brief overview of the most popular Microsoft-provided Windows management tools and what they are BEST at. I’ll cover SCCM, Intune, PowerShell & DSC and Azure Active Directory. Yes, yes, I know: SCCM has lots of OTHER features too, but this is where SCCM is BEST. Can SCCM deliver a registry setting which would be similar to a Group Policy setting? Can it copy a file down to the desktop, similar in function to a Group Policy Preferences setting? Yes, SCCM CAN do these things. But is it the BEST tool for doing these things? I would argue no; it is not the BEST tool to do granular policy-based management. SCCM is awesome at what it does, but it’s not trying to overtake Group Policy. Side note though: Just to muddy the waters a little bit with SCCM, there are some pre-baked functions which specifically overlap with existing Group Policy settings. The ones that come to mind are Power Management settings and Folder Redirection settings. In my opinion for these settings, pick one strategy: Group Policy or SCCM, because it becomes hard, almost impossible if you’re using multiple management technologies to manage the same settings. I’ll talk a little more about this “management overlap” problem toward the end of this manifesto. To be clear, Intune has two ways it can manage devices. One way is called the Intune client. And like SCCM it has to be installed on the endpoint to pick up directives. As you might imagine the Intune client (like the SCCM client) can only be installed on real Windows PCs and not, say phones. But what if you don’t want to install anything at all on your endpoint (or in the case of iOS, Android, or Windows Phones? Well, you don’t need too, and for that, you get some, but not all benefits. Intune (or similar 3rd party tools like Airwatch or MobileIron) can all use the same “receiver” to perform their newest directives. That receiver is called MDM: Mobile Device Management client. The MDM client (also known as the MDM platform) is a “cousin” and is similar to Group Policy; because like Group Policy, the MDM client is in the box (for Windows 10) and can receive directives, kind of like Group Policy does. The MDM approach calls for settings that achieve the admin’s intent without exposing every possible setting. In contrast, Group Policy exposes fine-grained settings the admin controls individually. MDM is good for sweeping ideas (also known as Intent), but not stellar at fine-grained settings management. So, what is “Intent” (MDM) versus “Fine-grained settings”(Group Policy) mean? Intent means that you might want something to be generally secure (aka VPN settings, Mail settings, Password length), but you really don’t care (or perhaps even get a chance to KNOW) what is happening under the hood. So when you want it done, across multiple operating systems, and don’t care HOW it’s done, then MDM works fine. It’s setting the settings (one, two or a zillion) but you don’t have to particularly know what. I can see where that’s good for some administrators, but totally frightening to others. This makes MDM the best choice for devices that are constantly on the go. You cannot drop a shortcut on a Windows 10 desktop using MDM. You can using Group Policy. You cannot rename the local Administrator on a Windows 10 desktop using MDM. You can using Group Policy. You cannot map a printer on a Windows 10 desktop using MDM. You can using Group Policy. You cannot prevent access to specific control panel applets on a Windows 10 desktop using MDM. You can using Group Policy. Okay. This gets really confusing really fast, so try to stick with me. Because Intune can use the Intune client OR the MDM client you actually get a different set of functions and possibilities depending on which client you use. In some cases, using the Intune client, Intune is trying to manipulate the exact same settings that would also take effect using Group Policy. The ones that come to mind are Firewall settings settings. But Intune’s future is to be reliant upon the in-box MDM client and not the installable Intune client. And, since MDM isn’t trying to overtake Group Policy’s granular functions that means, by definition, that means Intune isn’t trying to overtake Group Policy. Option 1: Ensure your people in the field use a VPN and connect consistently. Group Policy works perfectly thru VPN and will deliver on-prem Active Directory GPOs to your “constantly on the go” Windows PCs. Of course, this means that users need to initiate that VPN connection; and that could be problematic. Option 2: Extend your corporate network to the Internet using Microsoft DirectAccess. DirectAccess extends your intranet OUT to the Internet (but in a secure way.) DirectAccess is only available for Windows Enterprise edition, and can be a bear to set up. People I’ve talked with who have DirectAccess set up and working really love it. But they won’t talk with you about their deployment experience until AFTER you’ve got two beers in them. Option 3: PolicyPak Cloud (from my company PolicyPak Software) will take any Group Policy setting, let you EXPORT it, then upload it to our PolicyPak Cloud service. Then client computers automatically download and perform your directives. Not to brag, but “It Just Works.” And it works also for non-Domain Joined and Domain Joined machines. More information, demonstration videos and a free trial, check it out here. Option 4: PolicyPak On-Prem with an MDM Service. As of June 2017, we can take any Group Policy setting, let you EXPORT it, and use your own MDM service (like Intune, Airwatch, or MobileIron) and deploy 100% real Group Policy Settings using your EXISTING MDM service. Again, this “Just Works”. More information, demonstration videos and a free trial, check it out here and some FAQs PolicyPak On-Prem and your MDM service “better together” more about this here. Please don’t think I’m not “Pro Intune”. I am Pro Intune, for what Intune does best. It has an excellent Company Portal ability which enables self-install of applications to Phones and PCs, auto-enrollment of Phones, protects access to resources like Exchange mail and other corporate data. But granular management of domain-joined Windows PCs? It’s simply not the MDM-platform (and by extension, Microsoft Intune’s) best strength. What is interesting though, is that the very logical thinking behind MDM settings will increase Group Policy’s own set. In other words, when a team inside Microsoft wants to MDM-enable a setting, the goal is to do their best and also Group Policy-enable that same setting in Windows 10. So, thanks MDM team for rising the tide to lift all boats. That being said, there is no goal to back-port 5,000+ Group Policy settings to MDM but increase reach as needed. Complex functions which require logic and error handling. Configuring items which require a “method” (WMI, COM, API). Reading one value and then consequently writing another value. Bringing up a zillion similar servers, to a set of specific specifications. But not specifically CLIENT scenarios. Powershell and DSC are ludicrously powerful. But PowerShell is not meant to make ongoing configuration changes on your endpoints. And DSC is not meant to declare state for Windows endpoints aka Windows 7, 8.1 and 10. DSC is for SERVERS; and doesn’t have the ability to target computers in the same way that Group Policy does nor does it have the same function set, nor is it TRYING to be a GP replacement. Those tools try to tell servers how to be more secure and they use GP as the transport to get those directives embraced. But they stink. And DSC is a better choice for telling servers how to get stood up and be secure. DSC with Windows clients will work: since it’s part of the Windows management platform. But it is not DSC’s design center, and the client management teams are not driving DSC requirements. DSC alongside other management mechanisms (like Group Policy, or SCCM, etc..) would be considered “competing controllers”. Never a good idea with ANY two controllers managing the same resources (aka: target value) for writing. – Jeffrey Snover co-written with Jeremy Moskowitz, with Microsoft’s Aaron Margosis and Zach Alexander with the assist. Again: This is me *WITH* Jeffrey Snover, agreeing to these words. Thanks to Jeffrey and my other Microsoft pals for for helping contribute to this segment. Nano Server: What’s the deal with that? (Updated, July 2017). Continuing onward: Let’s talk about Nano server, why you should and/or shouldn’t care, and how Group Policy and/or DSC relates to Nano server. So: How what does this mean for Nano and GP support? If you’re looking at Nano server, there is no GP client (receiver) in Nano server. Which for me, is totally fine. Because, again, DSC is better for Servers and not clients. For more information on this, see this article from Zach A. from the GP team. Note: So that’s it for Nano. No GP support; DSC only, and .. that’s AWESOME NEWS for everyone. Since DSC’s design goals & best use cases are for Datacenter & Cloud scenarios (such as “Bringing up 400 servers in a controlled sequence.”) AND since Nano is now devoid of any infrastructure role, there is no tear to be shed that Nano has NO Group Policy support. PowerShell is the right job sometimes on clients. And DSC is the right job sometimes on SERVERS. But DSC is never right for endpoints (clients). Again: technically, you could apply DSC to endpoints and perform at least some of what Group Policy does, and expect it to work.. because DSC is built into the Windows platform. Therefore, as it sits today, neither PowerShell nor DSC is a sanctioned replacement for Group Policy on the client… ever. Q: Will DSC and Group Policy work together? A: No. They will fight like two raccoons in a bag. Anytime you’re trying to poke the same value with two management systems with different approaches, you are asking for trouble. So even if you don’t choose Group Policy (which, again, Microsoft is saying is “the best way to granularly configure domain joined Windows PCs and tablets connected to the corporate network” ) … okay. Fine. Whatever you use, use it consistently. For instance, Microsoft Intune has some guidance about using Microsoft Intune and Group Policy together here specifically detail how this situation is handled and provide some guidance to avoid problems like this. Also: I would say that SCCM and Intune also don’t fight like two raccoons in a bag, if only because they are built from the same team and have a well thought out hybrid model .. when you USE that hybrid model as designed. But you could go bananas and poke the same value with SCCM and Intune, in the WRONG way. Said yet another way, I’m not suggesting you use say, Group Policy exclusively or SCCM exclusively. I am saying you can use multiple management systems for different parts of the world. For instance, Group Policy CAN deploy software to your domain-joined systems, but I don’t recommend it. I recommend SCCM or purpose-built 3rd party tools, which are way, way better than what Group Policy can do with regards to Software Deployment. You can use SCCM to deploy desktops and use DSC to bring up servers. So for complete clarity: Group Policy, and say, SCCM can and often do work hand in hand. What I’m saying (again clarifying for emphasis) would be: Don’t use two management tools to poke at the SAME THING with TWO systems. That’s “Competing Controllers”. That is just asking for trouble. Use the right tool for the right job. What about Azure Active Directory ? So okay. If you have 10,000 iPhones, Android, Windows Phones and some Windows 10 PCs you don’t want to domain join, then I see some real value here. That scenario: I totally get with Azure Active Directory and auto-enrolled MDM. Azure AD Join is also a great solution for temporary staff, partners, or other part-time employees. These accounts can be kept separate from the on-premises AD domain but still access needed corporate resources. 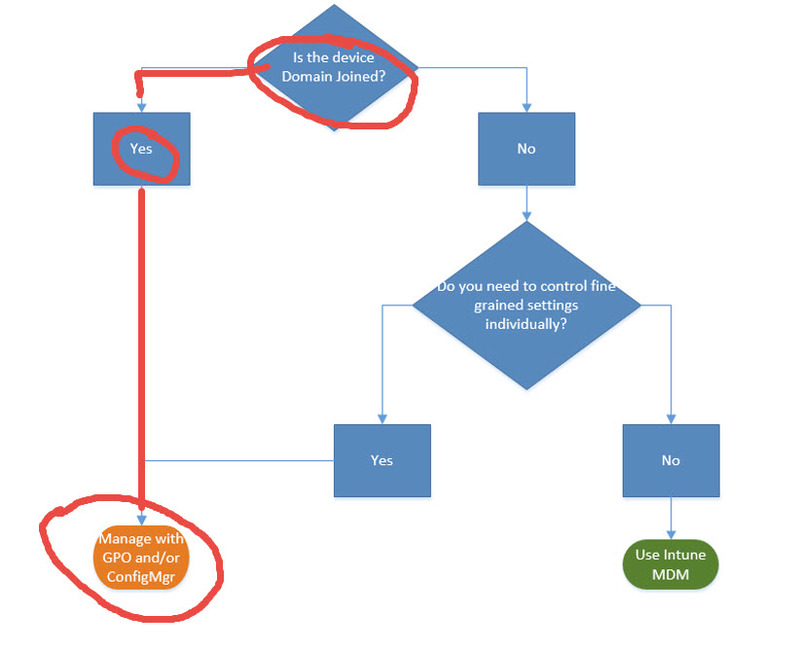 But, see the earlier talk about what MDM settings can do versus Group Policy settings. Microsoft has no cloud-based way to deliver real Group Policy settings thru Azure Active Directory: it is NOT a current design goal of Azure Active Directory, nor do I ever expect it to be. If you want real Group Policy thru the Internet, see the four solutions I suggested earlier: VPN or DirectAccess (for domain joined machines) or PolicyPak Cloud (for domain joined or non-domain joined machines), or PolicyPak On-Prem with your existing MDM service. This latest one is new as of June 2017. We announced at PolicyPak we also have TRUE Group Policy support along side any existing MDM service. 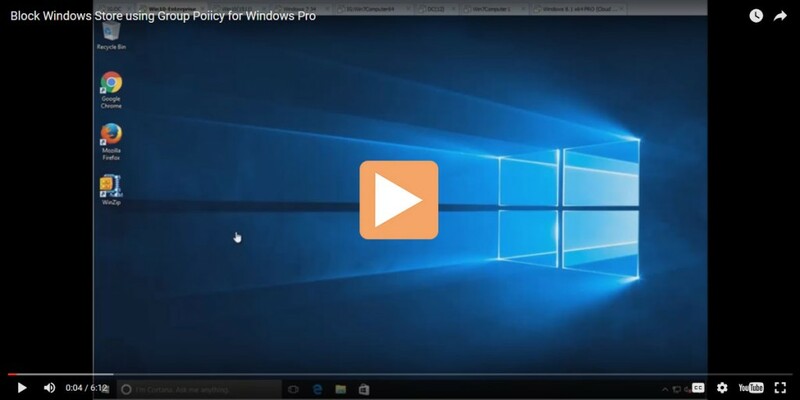 So if you have Intune, Airwatch or Mobileiron, and want to EXPORT real Group Policy for use with your MDM service, then check out these videos. We built this solution for customers who are just being told “You MUST use MDM and you need a way to get your existing GPOs handled via MDM.” Okay, if you want to do that, we provide the only true viable option for that. That about wraps up my “Why Group Policy is Not Dead” manifesto. I’m appreciative that Microsoft took the time and care to explain to all their customers (and also by extension, their field representatives) about how Group Policy isn’t dead and still very relevant in the Windows 10 era. Thanks to Jeffrey Snover, Zach Alexander and Aaron Margosis for contributing to this blog entry to help set the record straight. Tooling and guidance to stop Macro-based attacks. SecGuides for Group Policy-based security deployment. PS: If you’d like a “second opinion”, please see my Pal Stephen’s blog at FoxDeploy. He does a great job contrasting GP, SCCM and DSC. Here’s the link for that second opinion. It’s very well written. Nice job. Interview with Aaron Margosis.. Part 3 of 3: Microsoft Scams, Whitelisting, and Futures ! Aarons tips to making people more secure.